If you have broken the IPS LCD and can see black bleeding marks or the image on the LCD screen is distorted or missing in places and also you have cracked the glass touch screen / digitiser layer as well. You will need to have the whole iPad screen display assembly unit replaced. The replacements iPad screens used are brand new iPad screen units. A broken screen is classed by Apple as a non-warranty repair and they will charge you accordingly. 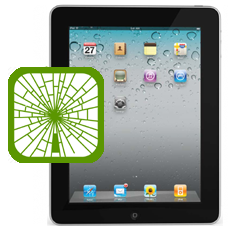 This iPad screen replacement service is far cheaper option and performed to our exacting standards.